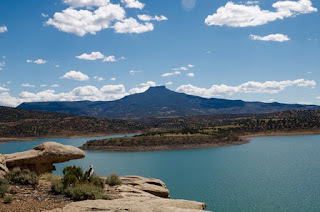 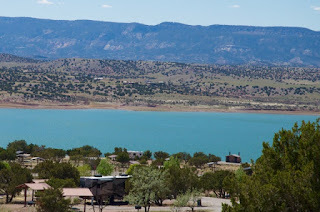 After pulling up stakes in Santa Fe, we headed 50 miles north to the Core of Engineers Riana Campground on Lake Abiquiu. Perfect. 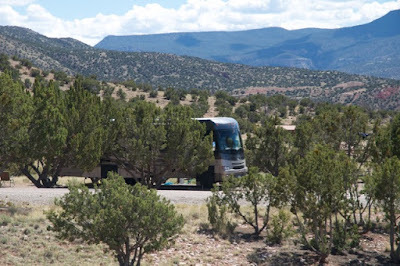 At this time in April the campground was mostly empty which translates to quiet and peaceful. 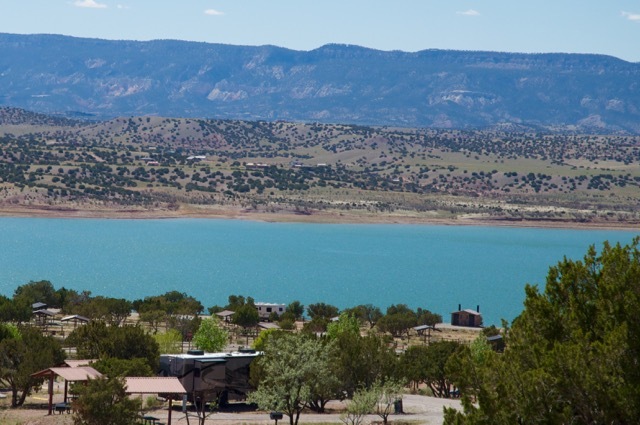 The views of Abiquiu Lake with the backdrop of Cerro Pedernal and the amazing pallet of color of the surrounding landscape were inspiring. 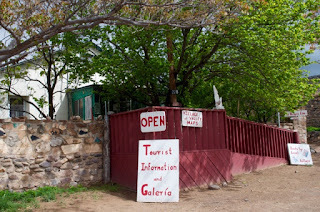 Yes, this made for a perfect headquarters for our visit to Abiquiu and the beautiful Rio Chama Valley. 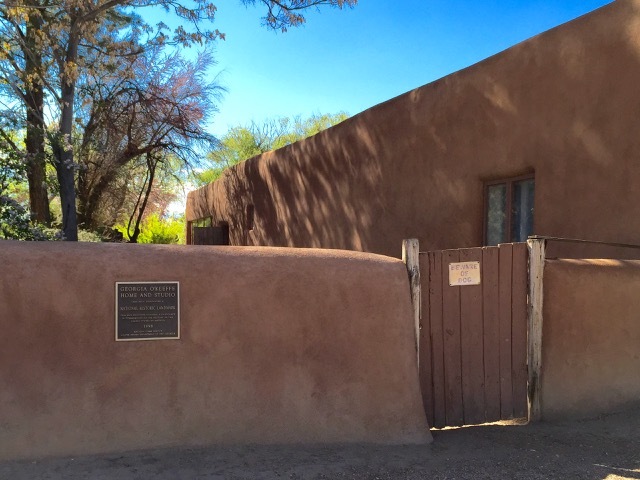 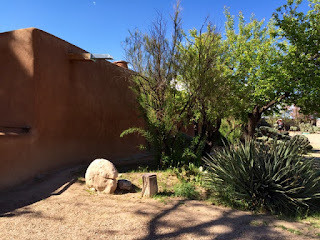 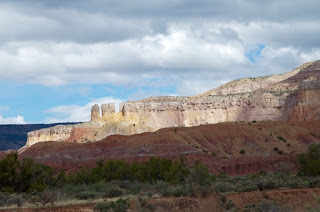 We had come to Abiquiu to tour Georgia O’Keeffe’s home and studio and visit Ghost Ranch a few miles up the valley. 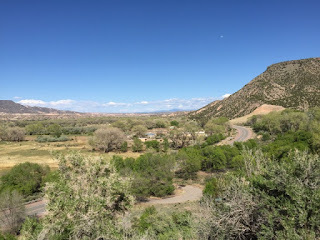 Little did we realize the area offered so much more. 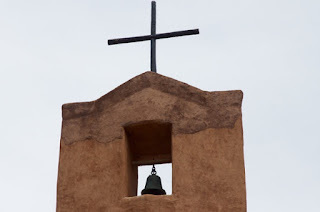 There is an interesting spiritual aspect here. 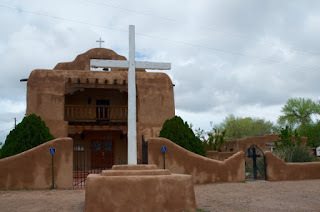 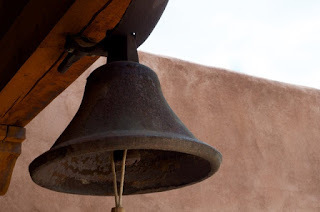 On the plaza in Abiquiu is the Santo Tomas el Apostol Church. 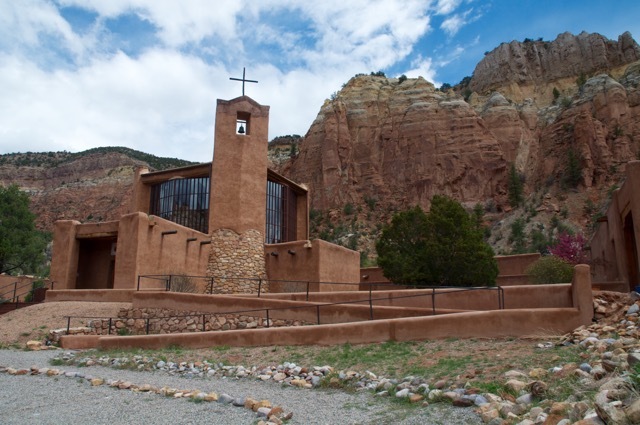 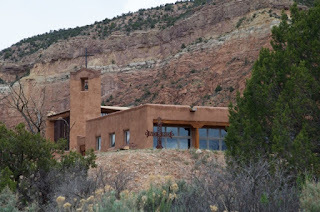 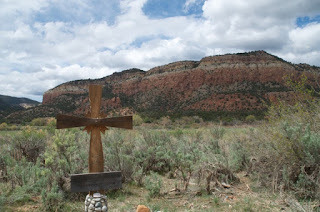 The Presbyterians run the retreat center at Ghost Ranch. Up the valley The Monastery of Christ in the Desert is tucked in a canyon along the Rio Chama River. 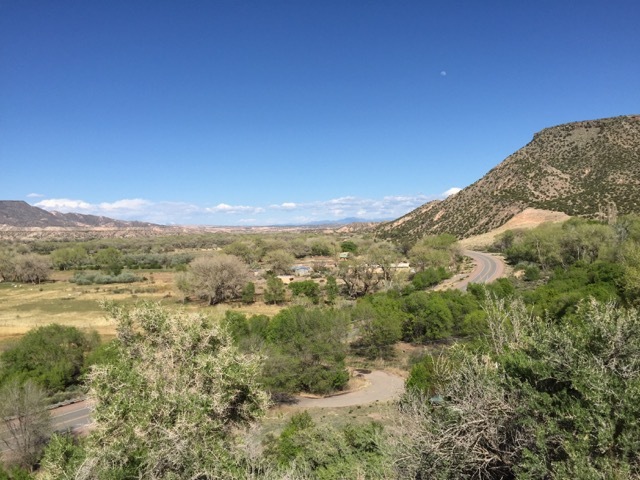 Across from the river from Abiquiu is the Dar Al Islam Mosque. We visited them all. Our trip to the monastery was the most adventurous. 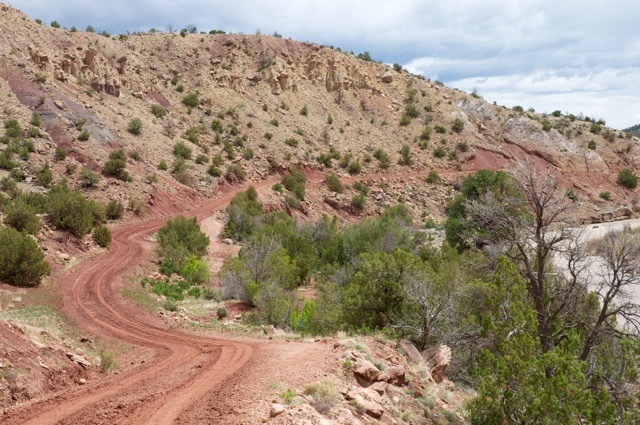 After leaving Hwy 84 you travel 13 miles on a dirt road. It would not have been too bad except for the fact that we took the trip right after a rainstorm and the road was a muddy mess – a challenge for our little Honda Fit. However, the trip and visit to the monastery was well worth the effort. The most unique was our visit to the mosque. 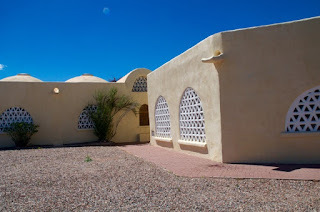 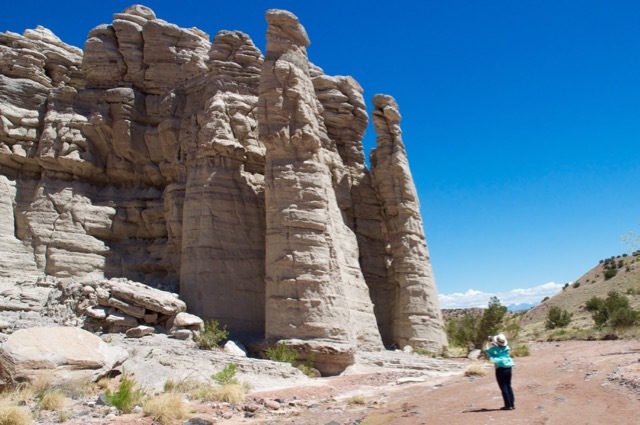 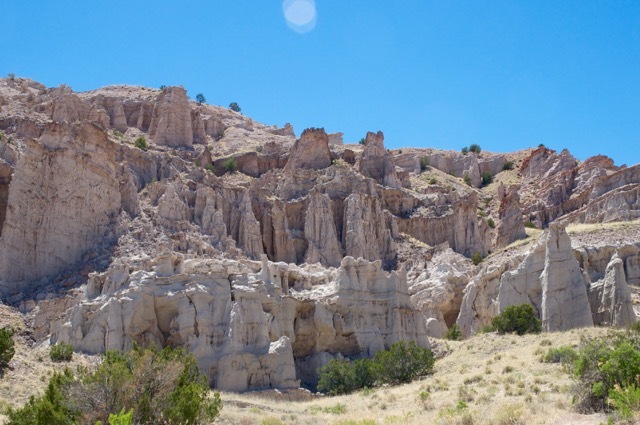 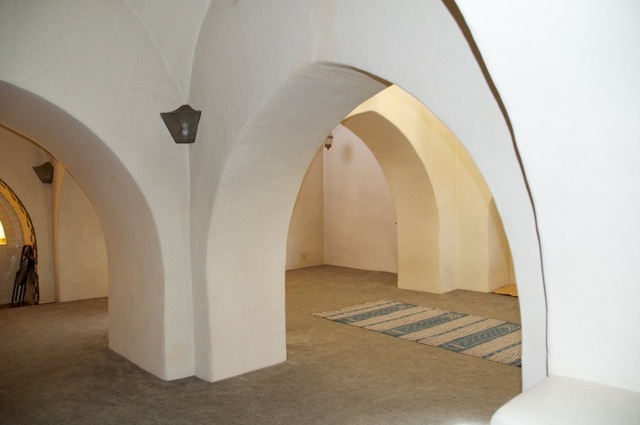 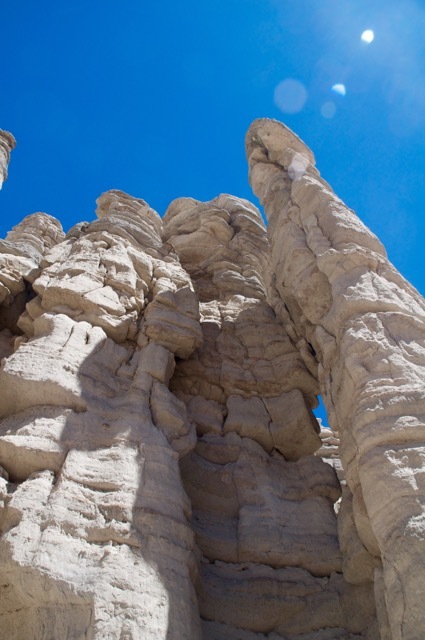 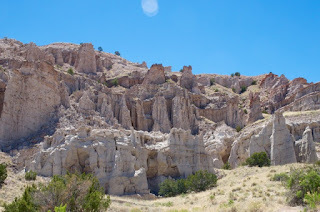 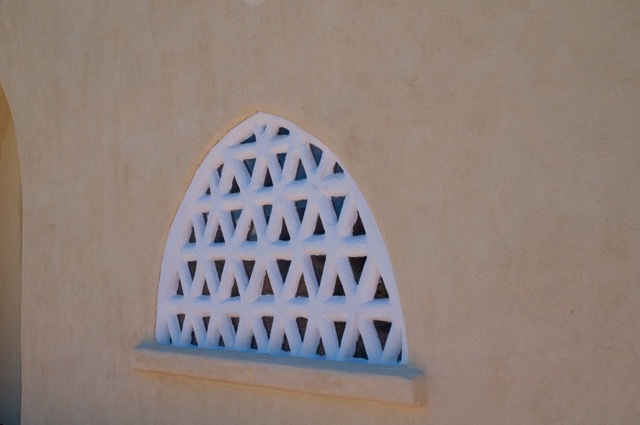 Our main destination was the Plaza Blanca -the place O’Keeffe called her “white place” and which is now on the grounds of the Dar al Islam Mosque. After a short hike we stopped and got permission to enter the mosque. 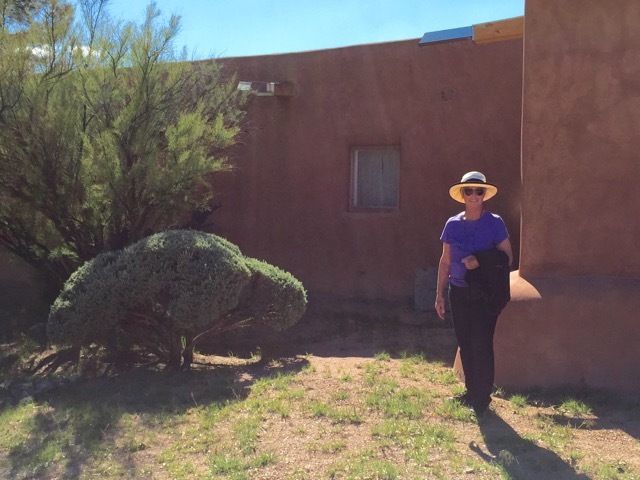 Of course we made it to Ghost Ranch and took the tour of Georgia O’Keefe’s Abiquiu home and studio (no pictures allowed inside). The house and gardens have a calm and tranquil feeling to them. 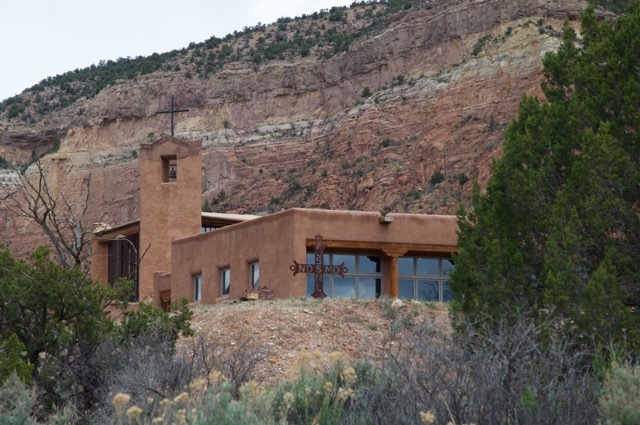 The house is at the top of the hill and overlooks the valley – the views are spectacular. 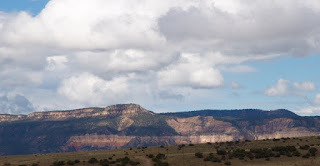 It is easy to understand how this area inspired her. It turns out 83 years old Napoleon is an Abiquiu native and local storyteller and historian. We learned that Napoleon is a decedent of Genizaros – Native Americans who had been taken captive and raised as servants by the Spanish. 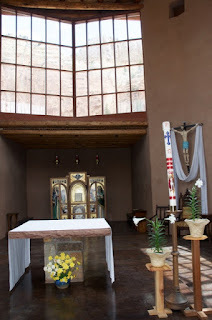 He shared stories about how as little boy helping workers build the church and as a young man working for and being fired by Georgia O’Keeffe. 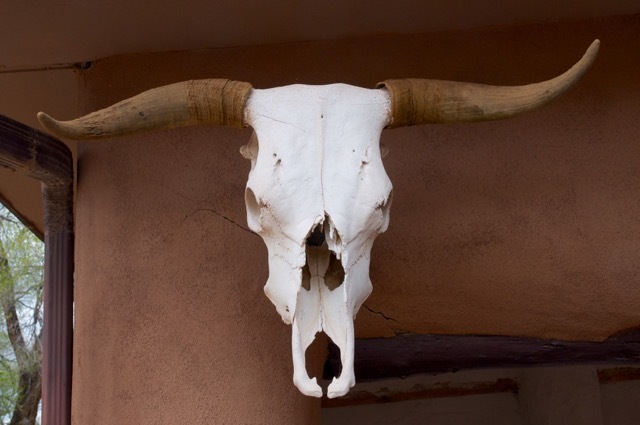 We asked him if she was a nice lady. 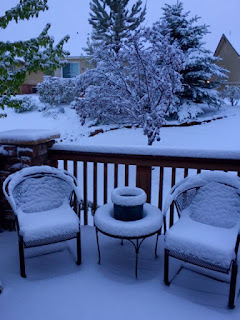 He said, “no”. We spent an hour or so talking with Napoleon who at the time was in a wheelchair recovering from a recent fall. 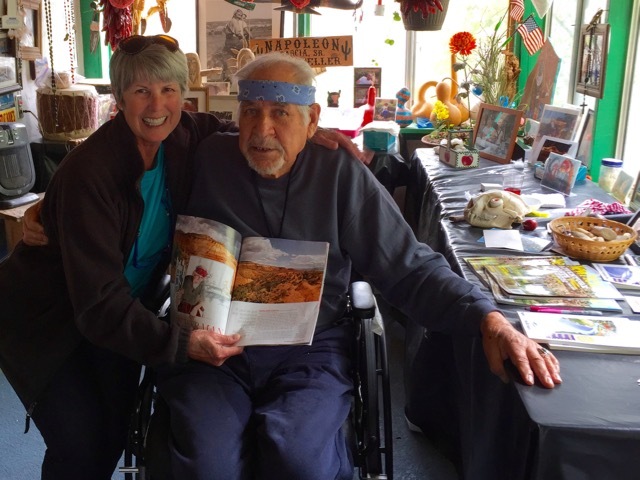 He autographed an article about him that appeared in the May issue of the New Mexico Magazine, loved having his picture taken with us and as we left he invited us to the Native American Feast Day as his guest. Perhaps some day…? 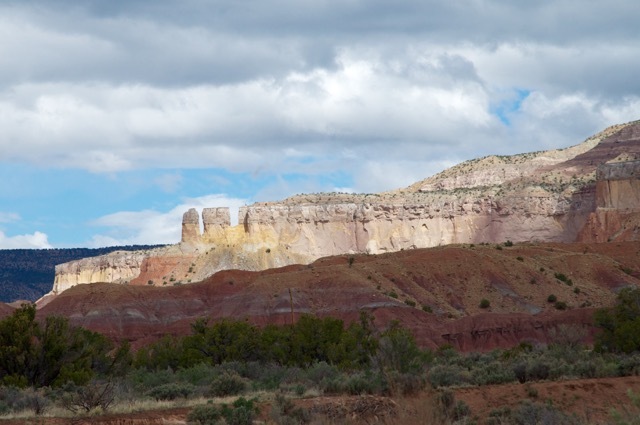 After a week in the Chama Valley it was time to head home. 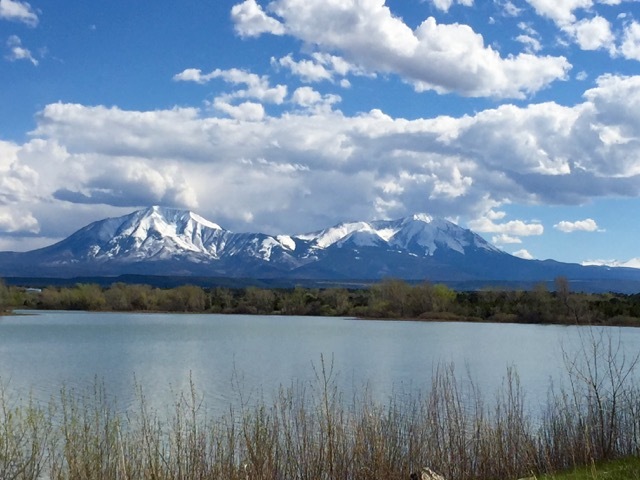 We stopped for a couple of days in the beautiful Lathrop State Park at the foot of the Spanish Peaks near Walsenburg, CO and then home… yes, to snow!